Schedule a weekly arms day. To hell with what some strength coach you&apos;ve never met says! If arms are your priority, train like it. Memorize this list of eight great arm movements, many of which you&apos;ve never tried before. Pick two of the eight movements. These will form the core of your next scheduled arm workout. If you&apos;re training for the pump, supplement for the pump. Otherwise, what&apos;s the point? Try a pump product, not just the same old pre-workout. Once you&apos;ve got those steps down, you&apos;re ready to step into the gym for the best arm thrash of your life—but not until then. Now let&apos;s meet the movements that are going to help you add size where it matters most. Start by lying on a bench with your arms extended forward and your palms in. Slowly lower the dumbbells until they nearly touch your forehead. Pause for one second and then straighten arms and flex the triceps. It&apos;s important here to keep the elbows in a fixed position and control each dumbbell through a full range of motion for maximum effect. 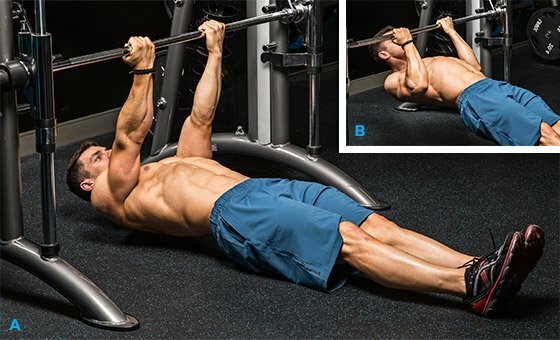 This heavy overhead extension targets an oft-neglected region of the triceps. It won&apos;t be easy. So many people avoid doing it, and suffer incomplete development as a result. While seated, hold dumbbells with an underhand grip—as if performing a biceps curl—and extended your arms until the dumbbells are overhead. 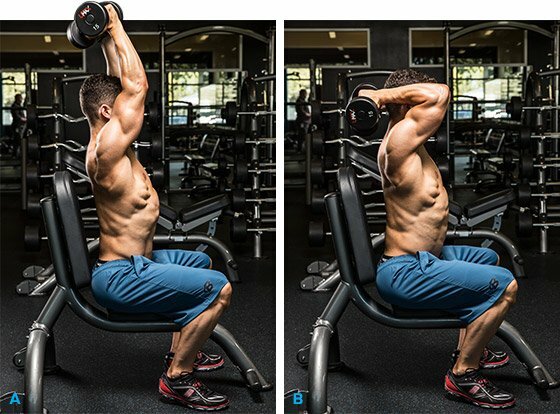 Maintaining a straight back, slowly lower the dumbbells to your upper traps until you achieve 90-degrees of flexion. After a moment&apos;s pause, flex your triceps to raise the dumbbells back to the starting position. Be sure to keep your shoulders back and avoid letting your elbows fall forward. Deemed potentially injurious and less beneficial than other moves, parallel bar dips have been swept under the rug. However, when correctly performed, they can stack more mass on the back of your arms due to their ability to overload all three triceps heads. To perform this move safely and correctly, hang between two parallel bars and use your triceps to push up until the arms are almost straight (not to complete lockout). Slowly lower your body, keeping your elbows tucked in to your sides and legs behind your body, until the upper arms run parallel with the floor. You know you&apos;re on the right track when you form a 90-degree angle between the upper arms and forearms. The high visibility of impressive biceps commands respect and conveys a respectable degree of upper-body power. Although they are beauties to be admired, the volume of work is often overstated. Because they already receive indirect tension from other upper body training, 2-3 movements per session for 2-3 sets of 8-12 reps each is ample for maximal recruitment. 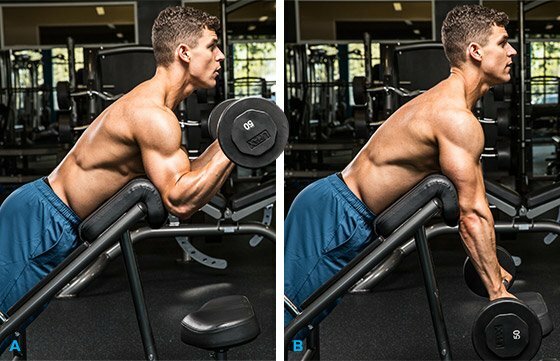 Add these three rather obscure movements to have your biceps reaching new developmental "peaks." Grasp two weight plates of the same size and resistance at arm&apos;s length, between your thumb and fingers. Extend toward the floor and hold for at least 30 seconds, then switch to opposite side. Flatter plates can be difficult to grip so it&apos;s worth experimenting with flat plates or hollowed-out plates. "The forearms are notoriously stubborn to train. They need both volume and massive weights to be properly hit. Get your guns! Take a page out of Biggie&apos;s book and learn how he prepares his biceps and triceps for an important contest. Here&apos;s to volume! Forget small-arms fire. It&apos;s time to turn your guns into cannons. Alex Carneiro&apos;s video workout will help you build bulging biceps and horseshoe triceps. NPC competitor Josh Halladay is on a quest for his pro card in 2014. Here&apos;s the off-season arms workout that he&apos;ll use to add serious muscle to his arms!